During the 7th century, many landowning aristocratic families attempted to achieve supremacy in Austrasia (France, Germany, Belgium, Luxenbourg, Netherlands). However, one family, known as the Carolingians would eliminate or assimilate rival families until they alone were the rulers. In 714, Charles Martel, a Carolingian, became the ruler of the Franks (France, Belgium, and Germany). Then in 732, he faced the Muslims in the Battle of Tours. The Muslim army took heavy losses before retreating into Spain. The battle is considered one of the most important military engagements in European history. Largely, Martel's victory guaranteed that the Muslims would not rule the Frankish Kingdom, and that instead, Christianity would remain the religion of the Franks. Pepin the Short, was Charles Martel's son, and he inherited his father's title. However, another family of aristocrats wanted control of the Frankish kingdom. They were called Merovingian. Pepin knew that he would need papal support if he were to be king. Luckily, for Pepin and the Carolingian dynasty, they had a very close relationship with the Catholic Church. Unfortunately, the Merovingian family lacked financial support. However, they believed that their family was entitled to the throne because they were descendants from a prestigious royal Germanic dynasty. They hoped that their name alone would allow them to take the Frankish throne. Eventually, Pepin convinced Pope Boniface, that he was the ruler, and not the members of the Merovingian family. Pepin was anointed at the royal monastery of St. Denis. The Carolingian family had long supported Boniface, and his missionary work. After losing the crown, the Merovingians were forced to spend the rest of their lives in a monastery. Pepin thanked the Catholic Church by rescuing them from peril. The Lombards had long been threatening the church and its holdings in Italy. Pepin responded by sending his army against the pagan Lombards. After defeating them, Pepin donated a large portion of central Italy to the papacy (pope). Charlemagne, Pepin’s son, was an amazing military commander, and he demonstrated a strong sense of responsibility over the welfare of the area he ruled. Charlemagne successfully advanced his idea of unifying and expanding the Christian West. Not long after taking his fathers place, the papacy requested that he also invade Italy and again force the Lombards into retreat. He did so. For more than 32 years Charlemagne launched a prolonged military effort against the pagan Saxons of northern Germany. He defeated them over and over, each time forcing them to be baptized. Unfortunately, they always rebelled. Charlemagne became so frustrated that he executed 4,500 unfaithful Saxons in one day. Eventually, over time, they accepted the Christian faith. Never before or after has Europe been as united as it was under Charlemagne. 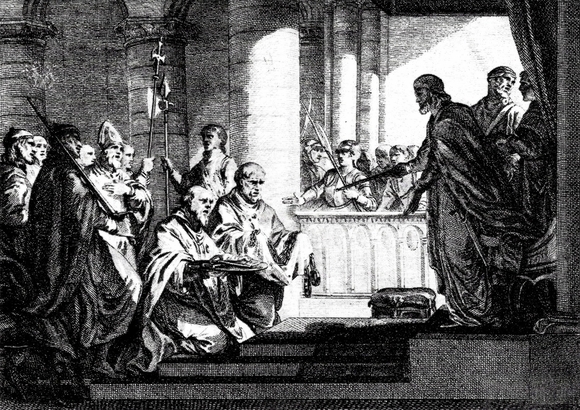 Not only did Charlemagne govern, but he also controlled church politics. At the time, he was a greater force in the church than the Catholic Pope. Charlemagne recognized the need for schools in his empire. He established schools in monasteries and churches. Many of these schools continued to thrive after his death.